We've spoken before about how there's nothing which Hollywood loves more than a success. That's why we have so many sequels -- If a movie is successful, you'd better believe that there's a good chance that we are going to see more of it. But, sequels aren't the only trick up producers sleeves. For decades, box-office hits would often be transformed into television shows. In most cases, the cast was completely different (and sometimes the story), but it didn't matter -- the company was banking on brand recognition to bring in an audience. While this sounds like an attempt at cashing in, some of these shows -- Alice, Buffy the Vampire Slayer, and Friday Night Lights -- have been quality programming. MTV now joins this club by bringing us Scream: The TV Series. The small town of Lakewood is rocked when high school mean girl Nina (Bella Thorne) is murdered. The killing is oddly timed, as it comes just after a video showing Audrey (Bex Taylor-Klaus) making out with Rachel (Sosie Bacon) went viral -- a stunt which Nina was most likely behind. Nina's friends -- Emma (Willa Fitzgerald), Brooke (Carlson Young), Jake (Tom Maden), Will (Connor Weil), Riley (Brianne Tju), and Noah (John Karna) -- are all shocked by this news. At the same time, Emma's mother, Maggie (Tracy Middendorf), the town's medical examiner, receives a gruesome package. This, combines with Nina's murder, dredges up a terrible secret from Lakewood's past. Brandon James, who was born with a disfigured face, went on a killing spree before he was shot by the police, and his body was never recovered. New sheriff Clark Hudson (Jason Wiles) suddenly finds himself thrown into this mystery, as his son, Kieran (Amadeus Serafini) tries to get settled in at school. As another murder occurs, two things become quite clear -- no one is safe and everyone is a suspect. Scream: The TV Series doesn't fit very easily into the tradition to shows which are spin-offs of movies. It's similar in theme and structure to the Scream films, and I guess that it could be argued that it exists in the same universe, but there are no connections between the two. The Scream movies took places in Woodsboro, while Scream: The TV Series is happening in Lakewood. There are no shared characters. Both deal with a killer who is stalking high-school students and the root of the mystery is a secret from the past, but that's where the similarities end. It was well publicized that the familiar Ghostface mask would not appear in the show. Instead, we get a mask based on Brandon James face. The voice which the killer uses on the phone is like that heard in the movies, but it's being done by a different actor. So, in essence, they could have called this show something else, but obviously the "Scream" name would bring in an audience. While the differences are there, the show was clearly patterned on the Scream movies. The show opens with a killing which is very reminiscent of Drew Barrymore's death in the first film. Emma is clearly the Sidney Prescott character, a high-school girl who is very happy in her life until she learns about her mother's past and things that her boyfriend has been doing. Topher Grace clone Noah is the stand-in for Randy. Blogger Piper Shaw (Amelia Rose Blaire) comes to town to cover the killings, just like the Courtney Cox character. The other characters are just as stereotyped -- bad girl, jock, etc. We get a masked killer and lots of red herrings. The show wants to bring us the same sort of hip, meta dialogue featured in the movies, such as when Noah states that you can't do a slasher film as a TV series. Really? Harper's Island did it in 2009 and was fairly successful. Despite this list of similarities and differences, what we essentially get here is a 10-hour Scream movie. If that sounds to you like something which would wear out its welcome, then you've hit the nail on the head. There's only about 5 episodes worth of story here, and it's stretched out across 10. In a 90-minute movie, you can bump off characters pretty regularly, but this show can't burn through everyone, so the murders come infrequently. Each episode attempts to have a big revelation, but most fall short of spectacular. The subplots, especially the one involving the mayor, feel very forced at times, and take us away from the main story. To the show's credit, the central story is interesting and the clues found in the hospital were interesting. But, this story gets bogged down in everything else and is lost at times. (I can't help but wonder if the central idea was once the kernel of a free-standing Scream movie that then morphed into a TV show.) There is one surprising murder and the show is somewhat violent for TV. But, in the end, Scream: The TV Series is exactly what it feels like -- a watered down and unnecessarily long version of the first film. Scream jump-started the horror genre when it appeared in 1996 and set a new standard for modern slasher films. Scream: The TV Series will not create the same sort of inspiration. Scream: The TV Series: The Complete First Season really could have used some Ghostface on DVD courtesy of The Weinstein Company. The three-DVD set contains all 10 episodes of the show's first season. The show has been letterboxed at 1.78:1 and the transfer has been enhanced for 16 x 9 TVs. The image is sharp and clear, showing no overt grain and no defects from the source materials. The colors look good and the image is never overly dark or bright, although much of the show takes place at night. The image is never distractingly soft and the depth is fine. The DVD carries a Dolby Digital 5.1 track which provides clear dialogue and sound effects. For a TV show on DVD, the audio effects are pretty good. We got noticeable subwoofer effects during the "shock" scenes and several moments provide impressive surround and stereo effects to highlight sounds coming from off-screen. 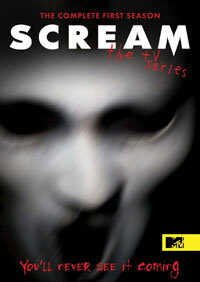 The Scream: The TV Series: The Complete First Season DVD contains a handful of extras, all of which are found on Disc 3. We get a 3-minute GAG REEL. The DVD contains seven DELETED SCENES which run about 6 minutes. This consists of one from Episode 5, two from Episode 6, one from Episode 8 and three from Episode 9. The "Promotional Gallery" contains nine brief interstitials, which run for a total of eight minutes, six of which focus on the main characters, and the last of which offers on-set footage from something called "Killer Party" which features personalities from other MTV shows being murdered in gruesome ways.